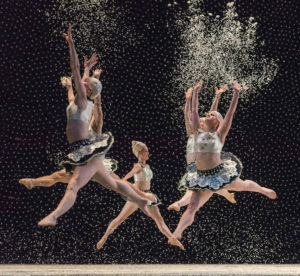 The Mark Morris Dance Group sleighed into town this past weekend with their holiday masterpiece, A Hard Nut. Now in its 26th year, this holiday treat is as fresh as the day it first appeared, decorated in red and green and swaddled with svelte ’50s–’60s fashions. A satirical updating of the Christmas specialty ballet based on E.T.A. 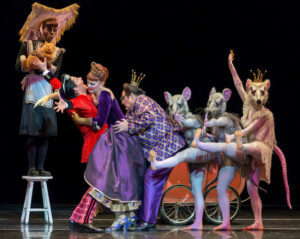 Hoffman’s story, The Nutcracker and the Mouse King, Morris’ ballet adds a little gin and tonic to the sugarplums, while keeping the story of the traditional Nutcracker ballet more or less intact. Again, the ballet opens with the Stahlbaum family celebrating Christmas with friends. Only this party, time-traveled to America ca. 1960, allows the partygoers to cast off everyday repressions under the guise of holiday cheer. The friends are a little too friendly and the alcohol-infused dancing a little too cheery, as partners twist their way across the floor. The kids of the family were watching TV before joining the party. The teenage Louise (Lesley Garrison) struggling with hormonal sulkiness, Fritz (Brian Lawson) torturing his sisters, and Marie (Lauren Grant) the innocent curly-haired baby sister restless with wide-eyed anticipation over holiday and presents. The Dance of the Snowflakes. Photo by Frank Wing. This performance Mark Morris danced the Dad, Dr. Stahlbaum, with John Heginbotham as Mrs. Stahlbaum. In high heels, Heginbotham is taller than Morris, but even more impressive were his tour jetés in high heels. Wow! He could dance Anita in West Side Story. As rollicking as the satire is, the ballet retains the magic that is at the heart of the Nutcracker. It’s what made ETA Hoffman one of the most avidly read writers of the 19th century, and it’s what enchants audiences every year as ballet schools and companies present this ballet, which premiered in St Petersburg in 1892. Not that the ballet was immediately popular. Rather its popularity dates from the 1960s, about the time in which the Morris ballet is set. The Dance of the Flowers. Photo by Frank Wing. The weird uncle Drosselmeier (Billy Smith) is at the Christmas party, with his mechanical dolls, updated to a silver-spangled Barbie Doll (Elisa Clark) and a Robot with flashing lights (Spencer Ramirez). And of course, he brings the fateful Nutcracker, which will be broken by the bratty Fritz and will enter Marie’s dreams to fight the Mouse King and bring Marie to the Land of Sweets. 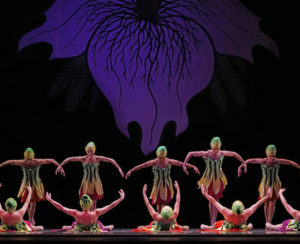 In Morris’ ballet the choreographer adds an enactment of Hoffmann’s original story within the story, “A Hard Nut,” told to Marie by Drosselmeier. As in all the versions of the ballet, the characters in the dream world are reconfigurations of the real world. Tchaikovsky’s music infuses the fantasy with its own sweetness, even though the composer struggled over the commissioned ballet, and hated it as a completed work. Despite that the music remains one of the most charming and most loved in the repertoire: with highly descriptive moments of snowflake flurries and character variations, and airy sequences like the trippingly exquisite sugarplum variation played on the celeste. The MMDG was accompanied as usual by the Berkeley Symphony, which did a lovely job. There is nothing quite like dance accompanied by live music. Costumes by Martin Pakledinaz and sets by Adrianne Lobel remain the same. Just as the choreography and staging have. And why wouldn’t they? They are perfect in every way. Performances continue through December 24, at Zellerbach Hall. For information and tickets, contact Cal Performances at calperformances.org.